In 1979, entrepreneurs Paul McKee Jr. and Richard Jordan linked their first names to form PARIC Corporation and launched a legacy as construction efficiency pioneers. The foundation of PARIC’s success is its people, who are given the support and confidence to make high-stakes decisions on the spot. This is not a micromanaged firm, but it is one that is highly selective in employment. Interviews for positions at PARIC are well known for their thoroughness and duration. As a result, an entrepreneurial spirit courses throughout the organization. Several PARIC employees have launched or now serve as senior executives at other building firms. That entrepreneurial culture earned PARIC the honor of Entrepreneur of Year in 1996. While technology became an integral part of PARIC’s operations, the firm set its sights on expanding the horizon of design/build. As the market struggled to find greater efficiencies in the often sluggish bid/build delivery method, PARIC turned the problem on its head by striving to become the first and last point of contact on its projects. The firm began orchestrating all facets of a project, including design, engineering, pricing, and subcontractor coordination. 1990’s After solidifying a strong, detail-oriented design-build model in the 1980s, PARIC entered the 1990s committed to building even stronger partnerships in both business and the community at large, including vigorous support of civic and philanthropic institutions such as the American Heart Association, United Way, Boy Scouts of America, American Cancer Society and Junior Achievement. At the same time, PARIC expanded its reach from the Midwest to work in the Dallas area. By 1991, PARIC emerged as a frontrunner in the healthcare market, as the company formed lasting partnerships with Barnes Jewish Hospital and St. Joseph Hospital. 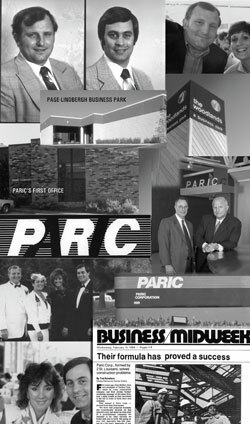 Soon after, PARIC also created a niche in the educational market, working on educational buildings, student housing facilities, performance theaters, research facilities, and even a venue for the 1992 St. Louis presidential debates, for institutions such as Washington University, University of Missouri St. Louis, Maryville University, Webster University, and St. Charles Community College. The accolades from the media, the industry and the business community continued to build, with Paul McKee, Jr. featured in a St. Louis Commerce Magazine cover story (focusing on PARIC’s people-oriented business model), and both Paul and Rick Jordan named the 1996 St. Louis Entrepreneurs of the Year in the Construction and Real Estate Category by the St. Louis Regional Commerce and Growth Association, St. Louis Business Journal, and Ernst and Young, in association with the Entrepreneur of the Year Institute. 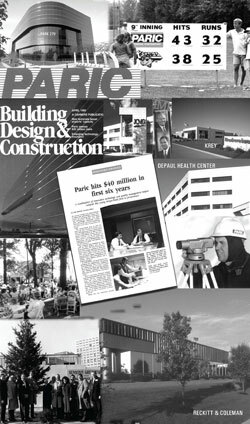 Again, PARIC ended the decade on the forefront, ranking 222nd nationally in Engineering News-Record’s Top 400 Contractor list in 1998. 1990’s The new century found PARIC being hailed by the St. Louis Regional Chamber and Growth Association as the champions of the design/build model, while leadership at the company was transitioning to the next generation, with Joe McKee named president and Greg Frick chief operating officer. In 2002, Joe McKee made the shift in leadership complete by purchasing the company from Paul McKee, Jr. and Rick Jordan, with the headquarters soon moving to 1001 Boardwalk Springs Place, O’Fallon, Missouri. That same year, PARIC cracked the Top 200 of the Engineering News-Record’s Top 400 Contractors list, at 178th, with ENR also ranking PARIC as 50th among the largest design/build firms in America. A testament to the company’s continuing commitment to safety, during the first part of the decade, the company reported a total of 1,000,000 hours without a lost time accident, with PARIC later winning the AGC’s Excellence in Construction Safety Award. 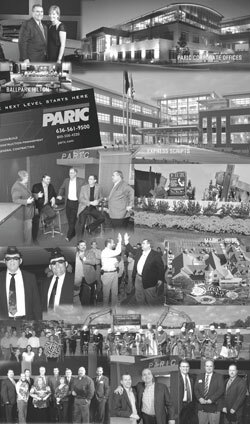 Throughout the decade, PARIC continued to receive recognition from industry, media, civic, and municipal sectors, with awards varying from the AGC’s Excellence in Construction Safety Award; the Mayor’s Spirit of St. Louis Award; the CMiC Innovation Award; AGC’s Keystone Award and the American Institute of Architects Design Merit Award. PARIC now was consistently completing projects throughout the Midwest region – including Illinois, Indiana, and Ohio — and ranking among the Top 400 Contractors in the Engineering News-Record’s annual listing, and had become a fixture in a multitude of other “Top of the Industry” lists. By 2007, PARIC moved to the ” next level starts here” encompassing a total customer experience, helping the customer envision their dream for their building or project. With a legacy of innovation spanning more than three decades, PARIC can lay claim to having helped elevate the efficiency standards of an entire industry. That commitment continues with innovations that are evident in PARIC projects today – with the potential to set a yet loftier standard for excellence in the delivery of construction services for decades to come. Capitalizing on the success PARIC enjoyed during the first decade of the new century under Joe McKee’s leadership, the company began looking ahead. In 2012, PARIC embarked on a leadership transition that included the ascension of Keith Wolkoff to President and a move into a new headquarters location in St. Louis County. 2012 also brought the culmination of a thorough evaluation of the PARIC brand that led to an evolution of the brand strategy and recommitment to the company’s Core Values. The rebranding resulted in a complete redesign of visual identity, codification of PARIC’s brand attributes and the subsequent slogan, Experience Excellence™.